The Kinesio Taping Method is applied over muscles to reduce pain and inflammation, relax overused tired muscles, and to support muscles in movement on a 24 hr/day basis. 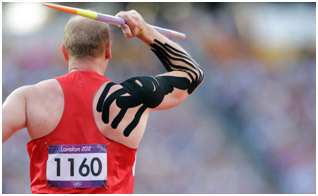 It is a non-restrictive type of taping which allows for full range of motion. It’s gained it’s popularity for it’s versatility. People can sweat, swim, and move freely while wearing the tape. It’s not just for athletes! It’s a great support method for those who have to work while dealing with an injury. When I was in high school, I developed a shoulder injury through baseball. I use kinesio tape during work and when exercising to help stabilize my injured joint. The tape normally lasts about a week depending o n what area of the body it is applied to. Common injuries that functional taping is used to treat are all sprains, plantar fasciaitis , low back pain, limited ROM, tension headaches, IT Band syndrome, tennis/golfers elbow, etc. Stop in today for a consultation, and see how this new technology can help you and your family.